PEMBROKE PINES - For more than 20 years, destinations have improved their share of cruise tourism by hosting the annual Florida-Caribbean Cruise Association (FCCA) Conference & Trade Show. From triple-digit increases in passenger and vessel arrivals to the development of new piers and cruise destinations, hosts of the FCCA Conference & Trade Show have directly benefited from spotlighting their products, experiences and infrastructure to the industry's most influential decision makers-over 100 executives, presidents and CEOs from FCCA's 19 Member Lines. Cozumel and Mexico aim to actualize these benefits by hosting their second FCCA Conference & Trade Show from October 5 - 9, 2015. The destination knows the significance of hosting this event because of their progress after their first Conference in 2007. According to data from the port authorities, in 2006 Cozumel received 2,028,002 passenger arrivals, and Mexico received 5,551,176. Just one year after hosting the event, Cozumel experienced a 21 percent increase, with 2,450,381 passenger arrivals from FCCA Member Lines alone, and Mexico saw 10 percent growth, with over 6.1 million Member Line passenger arrivals. Plus Cozumel continued rising, seeing over 3.3 million passenger arrivals from FCCA Member Lines last year and garnering the second-most passenger arrivals in the region. As Cozumel and Mexico recognize, these numbers extend far beyond the cruise pier; they impact the entire country's economy, to the tune of $565.4 million in passenger, crew and cruise line spending, in addition to 15,990 jobs and $93.5 million in wages generated through cruise tourism, per the Business Research & Economic Advisors (BREA) 2007 study,Economic Contribution of Cruise Tourism in Mexico. The 2009 BREA study, Economic Contribution of Cruise Tourism to the Destination Economies, found that the average expenditure per passenger in Cozumel was $104.58 (a 17 percent increase compared to 2007), which directly benefited numerous industries through purchases of goods and services, including food and beverage at restaurants and bars, shore excursions, ground transportation and retail purchases. The same study showed that Cozumel benefited from crewmembers spending $25.6 million for similar products and services; cruise lines paying $24.6 million; and cruise tourism generating 7,089 jobs with wages of $41.4 million (a 28 percent increase compared to 2007). By these numbers, if Cozumel's 2014 FCCA Member Line passenger arrivals grew the same 20 percent experienced after hosting their first FCCA Conference & Trade Show, it would represent $69.4 million more in passenger spending alone, along with the coinciding increases of employment and crew and cruise line spending, as well as indirect contributions that include supplies purchased by tour operators, restaurants and port authorities. 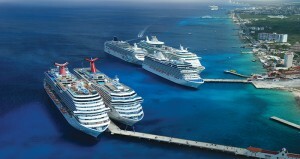 Even a single additional cruise vessel would carry a large economic wake for Cozumel and the country. BREA's figures show that just one average cruise ship-130,000 GRT, carrying 3,000 passengers and 500 crewmembers-in Cozumel generated $313,740 in passenger spending and $31,740 in crew spending, along with roughly $29,000 in port fees, totaling $374,480 in direct economic contribution, not including employment and indirect contributions. Considering this potential economic impact, it becomes easy to understand why Cozumel and Mexico again decided to invest in the country's economy by hosting the FCCA Conference & Trade Show. To learn more about and/or register for the FCCA Conference & Trade Show, please visitwww.regonline.com/fccacozumel.